3/4" Thick Clear Acrylic Triangle available in four different sizes, laser engraved to a frosted white text. Image shown with full color imprinting, available as an optional imprinting method to this acrylic award. 1 1/4" Self standing clear triangle shaped obelisk available in three sizes, laser engraved to a frosted white text. Full color imprinting available as an optional imprinting method for this acrylic award. 1 1/4" thick clear self standing acrylic award available in two sizes, laser engraved to a frosted white text. Full color imprinting available as an optional imprinting method for this acrylic award. Triangle shaped acrylic award, attached to satin silver finish wired frame resting on a black acrylic base. Full color imprinting available as an optional imprinting method for this acrylic award. Jade Glass Award Triangle with Slant Edge Base 3" deep base attached. Cardboard gift box included. Pure K9 premium optic crystal award. Looking for an award that will stand out V stands for Victory. Available in three sizes. Pure K9 premium optic crystal award. The top is a triangular shape piece with a thin blue crystal bottom which separates it from the base. Quality workmanship at a great price point. 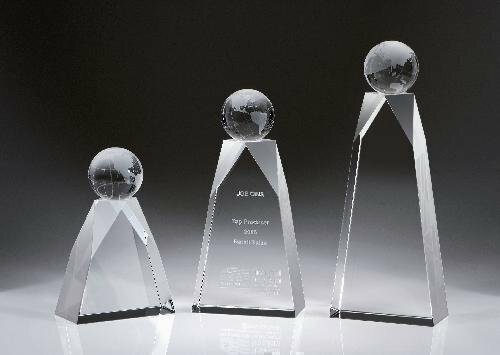 4 3/4" wide x 9 3/4" tall x 2 3/4"
The Globe World Tower is budget friendly crystal award made with a large chunk of highest quality crystal and simply modern designed piece.